Pixel Scroll 1/26/17 What Is The Pixel Capacity Of A European Scroll? Laden or Unladen? Aaargh! (1) END OF PERIOD. 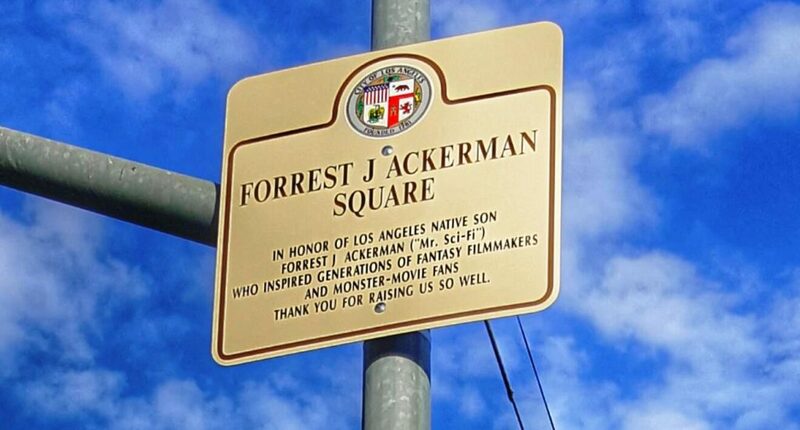 As John Hertz said in his report on the dedication of Forrest J Ackerman Square, the city promised to replace the original sign with the erroneous period after the initial “J” – erroneous, because Forry spelled his name without one. And as you can see in this photo by Robert Kerr, the city has installed the corrected sign above the intersection. (2) BIG ANNIVERSARY CELEBRATION. Greg Ketter’s Minneapolis bookstore is featured in “Wi12: Busman’s Holiday Possibilities” at Shelf Awareness. Since opening on April 1, 1977, DreamHaven Books & Comics has moved 10 times and even had multiple locations open at once. Today it’s located in an approximately 3,300-square-foot storefront at 2301 East 38th street, the store’s home for the last eight and a half years, in a neighborhood around five miles southeast of downtown Minneapolis. According to owner Greg Ketter, despite various changes over the years, DreamHaven’s specialization in science fiction, fantasy, horror and comic books has remained constant. The book inventory is a mix of used and new, with a higher proportion of used, rare and collectible books than in years past; Ketter also carries a great deal of movie and comic memorabilia. One of the store’s centerpieces is a towering model of Robby the Robot from the film Forbidden Planet. Throughout the store other models and statues abound. DreamHaven is celebrating its 40th anniversary with a party on April 1. Ketter has author appearances and a sale planned for the day, and is working in concert with Once Upon a Crime, a mystery bookstore in Minneapolis celebrating its 30th anniversary this year. (3) BROUGHT TEARS TO MY EYES. Randy Byers, co-editor of Chunga, has promising news about the progress of his cancer treatment. (4) INCONSTANT MOON. A little birdie told us that Larry Niven’s award-winning story may be filmed — “’Arrival’ Producer Developing ‘Inconstant Moon’ Sci-Fi Movie for Fox”. Fox 2000 is launching development on a movie based on Larry Niven’s science-fiction story “Inconstant Moon” with Oscar-nominated “Arrival” producer Shawn Levy and his 21 Laps company on board. “The Specatcular Now” director James Ponsoldt is attached from a script by Daniel Casey. Levy and 21 Laps’ Dan Cohen will produce along with Ponsoldt through his 1978 Pictures company and Vince Gerardis through his Created By company. “Inconstant Moon,” which first appeared in the 1971 short story collection “All the Myriad Ways,” begins with the moon glowing much brighter than ever before, leading the narrator to presume that the sun has gone nova and that this is the last night of his life. He spends the night with his girlfriend but then discovers that the reality is that the Earth has been hit by massive solar flare that kills most the inhabitants of the Eastern Hemisphere. Levy received an Oscar nomination Tuesday for producing “Arrival” along with Dan Levine, Aaron Ryder and David Linde. “Arrival” was nominated for eight Oscars, including Best Picture and Best Director for Denis Villeneuve. (5) A REALLY BAD MAN. Atlas Obscura reminds us about a forgotten fictional character who had a major influence on genre fiction over the years: “The Criminal History of Fant?mas, France’s Favorite Fictional Villain”. His creators called him the “Genius of Evil” and the “Lord of Terror,” but he remained a cipher with so many identities that often only Jove would recognize him. The book that first introduces him begins with a voice asking: Who is Fantômas? January 26, 1934 — One of America’s best-loved movie projects gets underway as producer Samuel Goldwyn buys the film rights to The Wizard of Oz. (7) FAUX FACTS FOR SALE. Chuck Tingle’s Buttbart has opened an Alternative Fact Warehouse where you can purchase such alternative facts as “JOM HAMM IS YOUR HANDSOME ONLINE BUD WHO LIKES TO SKYPE” for a few dollars, with the proceeds going to Planned Parenthood. (8) HE SAID ILK. Milo is scheduled to speak at UC Berkeley on February 1. He was prevented by protestors from speaking at another UC campus a few weeks ago. UC Berkeley Chancellor Nicholas Dirks has issued a statement reminding the university community that theirs is the home of the Free Speech Movement. Mr. Yiannopoulos is not the first of his ilk to speak at Berkeley and he will not be the last. In our view, Mr. Yiannopoulos is a troll and provocateur who uses odious behavior in part to “entertain,” but also to deflect any serious engagement with ideas. He has been widely and rightly condemned for engaging in hate speech directed at a wide range of groups and individuals, as well as for disparaging and ridiculing individual audience members, particularly members of the LGBTQ community…. As part of the defense of this crucial right, we have treated the [Berkeley College Republicans’] efforts to hold the Yiannopoulos event exactly as we would that of any other student group. Since the event was announced, staff from our Student Affairs office, as well as officers from the University of California Police Department (UCPD), have worked, as per policy and standard practice, with the BCR to ensure the event goes as planned, and to provide for the safety and security of those who attend, as well as those who will choose to protest Yiannopoulos’s appearance in a lawful manner. In 2017, I’m going to be getting one of these. Nice, huh? They look nifty, right? Here, let’s pull back a bit. Yeah, I’m pretty much going to lay my cards on the table and say this is going to win the second annual Dragon Awards in 2017. This is not actually a boast. It’s just logical. No, seriously. Follow me around the windmills of my mind. Live and Let Bite is everything you loved in Honor at Stake and Murphy’s Law of Vampires, and then doubles down. (10) THE MAGIC NUMBER. Dan Koboldt gives “5 Reasons to Vote for the Hugo Awards”. Most of us read enough novels to know how we want to vote in that category. Novels and series are the bread-and-butter of the SF/F genre. Furthermore, after the commercial success of Game of Thrones, Westworld, and other franchises, there are arguably more people reading SF/F novels than ever before. Thousand of people vote for the “best novel” Hugo Award. I wish we could say the same about short stories, novelettes, and novellas. Short fiction is a critical form of SF/F literature, and indeed is how many of us learned how to write. There are some wonderful markets that publish it — Clarkesworld, Galaxy’s Edge, and Nature, just to name a few — but the readership is much, much smaller. The Hugo Awards are a great opportunity to discover, read, and reward outstanding works in these briefer formats. (11) AN ICE TOUR. Val and Ron Ontell are organizing pre- and post-Worldcon tours designed for those heading to Helsinki. Before the con there is a tour of Scandinavia, Talinn and St. Petersburg, and afterwards a tour of Iceland. Itineraries for both are at the site. (12) FISHING WITH BAIT. John Joseph Adams has posted Hugo-eligible items and from Lightspeed, Nightmare and anthologies, and is offering to e-mail additional material to Hugo nominators with proof of voting eligibility. If you are planning and eligible to vote for the Hugos this year, if you email me proof of your Worldcon membership (i.e., your name is listed on the Worldcon website as an attending member, or the email confirmation or receipt you received when you purchased your membership, etc.) I would be happy to make some additional 2016 material I edited available to you in digital format. The paper on E Pluribus Hugo by Bruce Schneier and I had made it through peer review when the journal that had accepted it (Voting Matters) suddenly lost its funding and retroactively folded. We were trying to pressure the editor who had accepted it to help us find another place for it, but it looks as if that’s not happening. We’re still planning to publish it in another journal, but sadly we’ll probably have to repeat the whole peer review process. However, it is our belief that the paper is still eligible to be nominated for Best Related Work. (14) TICKY. The Science and Security Board of the Bulletin of the Atomic Scientists make it out to be two-and-a-half minutes til Midnight — “Doomsday Click Moves Closer to Midnight, Signaling Concern Among Scientists” in the New York Times. In an op-ed for The New York Times, Dr. Titley and Dr. Krauss elaborated on their concerns, citing the increasing threats of nuclear weapons and climate change, as well as President Trump’s pledges to impede what they see as progress on both fronts, as reasons for moving the clock closer to midnight. By Jameson Quinn: As discussed in previous threads such as this one, I and others will be making an EPH+ proposal to the Business Meeting; and so I was running a fundraiser so that I could be there to help explain it. The good news is that fundraiser has reached its goal. Yay! I’ll see you all there! Thank you to everyone who’s supported it so far. But the fundraiser is not over. I have been working on these issues, unpaid, off and on since early last year. 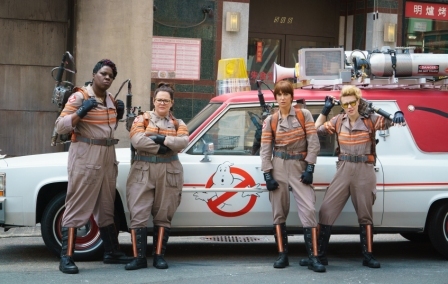 I’m doing that partly because I have always been a fan, though not prior to this a congoing fan. But my main motivation is just that I’ve devoted a nontrivial part of my life to thinking about better voting systems, and I see this as an opportunity to use that knowledge while helping educate people about the advantages such systems offer. So, like my own involvement in this issue, my fundraiser is not merely for myself. I’m raising funds for the Center for Election Science (electology.org), and all donations are tax-deductible in the US. As an organization, we do education, research, consulting, and advocacy around issues of voting systems; that is, exactly the same kinds of work I’ve been doing with EPH and the Hugos. With the support this community has given so far, I’ll be able to be there at MAC II; but if you can give us more support, we can do more. It doesn’t take more than a glance at the newspaper these days to see the fallout of poor election systems. I’ll discuss a few examples here, to help show what good systems have to offer. Let me begin by saying that the CES is a nonpartisan organization. I’m going to speak not as a voter with my own personal point of view on these matters, but as a voting system designer, in the faith that societies and organizations should be free to make their decisions democratically and that such democratic decision-making is the most sustainable, if not always the fastest, way to come to the correct decisions. In the UK, a momentary bare majority managed to take a decision whose impact will last decades. Of course, every decision has impacts, and from a long term perspective every majority is temporary; but from my point of view as an election theorist, asymmetrical decisions like Brexit should require a supermajority. There were at least two asymmetries in this case. First, you can tear up a treaty any time, but once you’ve shredded it, it’s much harder to tape it back together. And second, the consequences of a “remain” vote were relatively clear, but the very meaning of a “leave” vote was quite vague, allowing a situation where there were groups of “leave” voters with entirely contradictory visions of what the post-Brexit relationship with Europe should be.In light of those asymmetries, the “Brexit” referendum should not have been symmetrical between yes and no. A “yes” result should have taken more than a “no” result. That could have taken the form of a supermajority requirement, but the problem with that is, any such requirement is essentially arbitrary. A better way to do it would be to have required two consecutive results in order to leave, with some time for deliberation in between. In the US Democratic party, there was a tough battle between Bernie Sanders and Hillary Clinton. Clinton won, and a key factor in that victory was her strong support from African-American voters, a cornerstone constituency of the party. Yet because of an antiquated primary election schedule, most of the early campaign for both Sanders and Clinton had focused on two of the Whitest states in the country: Iowa and New Hampshire. I believe both of the candidates would have been better served by a schedule where the initial states looked more like the country as a whole, especially in terms of the demographics of the Democrats. Meanwhile, on the Republican side, Donald Trump won the nomination despite getting a minority of votes in the primary contests. Because the primaries used vote-for-one plurality, his numerous opponents split the vote, allowing his minority support to put him into the a clear lead from the start. If the primary elections and polls had been run using a better system such as approval voting, the anti-Trump voters would have had a much easier time showing their strength. We can’t know for certain who would have won under such a system; some might argue it still would have been Trump. But if it were, he would have had to win by uniting Republicans behind him, not just by dividing his opposition. Elsewhere in the news, we see repeated terrorist attacks in various countries; and many of the attackers are affiliated with or claimed by ISIS/Daesh. ISIS arose in Iraq, in the power vacuum left after George Bush toppled Saddam Hussein. And George Bush would almost certainly never have become president in 2001 if it hadn’t been for the broken election system in Florida, where he got a minority of votes but still took the state’s electoral support. In this case, it’s pretty clear that under approval voting, things would have gone differently; if third-party voters had been able to support both their favorite candidate and a backup compromise, all evidence suggests that the minority Bush got would not have been enough to win the state. (Bear with me for one last “river city” transition.) We recently saw a failed coup in Turkey, in which elements of a more-secular military tried to take the country from a democratically-elected Islamist president. This echoes the successful coup in 2013 in Egypt, in which Islamist president Morsi was overthrown by military strongman el-Sisi. Morsi was the only democratically elected president in Egypt’s history. But tragically, Morsi, like Bush, had won despite the fact that most of the country voted against him; and this “unpopular mandate” is arguably a large part of what led to the coup. His initial win was a two-round election. In the first round, there were several candidates: two Islamists (Morsi and Fotouh), a representative of the military and old guard (Shafik), and two more-secular reformers (Sabahi and Moussa). Morsi and Shafik were the top two in that round, and so, despite the fact that their combined total was under 50%, they faced each other in the runoff, with no reformist option on that second ballot. Though opinion polls in this situation were unreliable, all the two-way polls we have that matched either Morsi or Shafik against a reformer show that a reformer could have won if they’d made it to a runoff! And the reformist candidates’ combined total in the first round easily surpassed either of the individual totals of the two who did progress. Thus, it seems very plausible that a better voting system (such as approval with runoff, or majority judgment) could have avoided the situation that led to the Egyptian coup in the first place. I don’t want to spark a thread of political debate — there are other blogs for that. But I hope I’ve made my point that election system reform is not just for the Hugos. In many countries, and especially here in the US, polls show satisfaction with available the political options at an all-time low, but across most of the English-speaking world we use plurality voting, a horrible system which is structured so as to blunt the incentives for the existing parties, or the ability of new parties, to viably offer new ideas. If you care about breaking this stalemate, you care about election systems, and electology.org deserves your support through my fundraiser. Or, sign up for our newsletter to learn more about how we’re working on this problem. My original budget for going to the con was $1400, including membership, train fare (I prefer trains over airplanes to save on CO? ), lodging, expenses, and youcaring’s small crowdfunding fees. I lowered that to $1300 in order to help get the fundraiser over the top. But really, I’d like to see this pass $2000, so please, if you can, support us. Frankly, the CES needs the money, as we testify before legislatures, attend other conventions and run straw polls, engage with media and produce educational materials, carry out research, work on software tools, consult with awards organizations such as the Hugos and Webbys, and other activities. Our Executive Director is committed to the cause and draws low wages, but I know for a fact there’s at least one other charity that wants to steal him from us at higher wages, so we really need to begin paying him a larger fraction of what he’s worth. By Jameson Quinn: Since the last thread (“To Say Nothing of the Dogs”), there hasn’t been a whole lot of progress in Hugo voting proposals, but it’s still clearly time for an update on various fronts. Make the following two proposals this year, hopefully to pass and ratify at least one of them. This means a second round of voting in which the “longlist” of the top 15 from the first round is publicized, and clearly-unworthy works from that list are eliminated if they have enough votes against. It is not intended to deal with mere matters of taste, but merely to insulate against offensive works promoted by slate voters. The text of this proposal is being worked on by a group of (what I’d respectfully characterize as) SMOFs led by Colin Harris. They are behind schedule for various reasons but still plan to reach the finish line. This means using the Sainte-Laguë divisors with EPH; that is, SDV-LPE-SL, as explained in my paper with Bruce Schneier. To put it in more understandable terms: it’s like EPH, but is slightly harder on works with above-average overlap with other winning works, so that a slate or slates like last years’ puppies could probably average under 3 nominations per category. The text of this proposal is included below. This is meant to go along with 3SV. It would mean that each voter in the second round could add 2 (or 1) nominations per category for works on the longlist. These nominations would be treated the same as first-round nominations. This would help people make sure that their ballot would have at least one nomination with a viable chance of becoming a finalist, without requiring them to run out and read a full longlist in each category. By doing so, it would help reduce the “long tail” issue, and thus increase the power of non-slate voters. Since slate voters can already ensure they have nominated works on the longlist, their voting power would be largely unaffected. This is also meant to go along with 3SV. It would mean that the elimination ballot would have three options; not just “eliminate” or “keep”, but also “keep but extend”. If a work with a quota of “keep but extend” votes became a finalist, then the number of finalists would be increased by one in that category. This would ensure that slate voters could not push things off the ballot using nominations for things that have non-slate support (such as the puppy support for Sandman: Overture this year). So, if this is the plan, what still remains to be done in this thread? Discuss whether this plan should be modified (I think not, but I’m open to counterarguments). Settle on a wording for EPH+, find co-signers, and submit the proposal. Current draft is below. Make sure the Colin Harris/ Kevin Standlee group submits their 3SV proposal. For now, I trust that they’re on the job, but if they continue not to have a proposal, I’ll shift that trust to the community to get them back on track. If people want me to be there at WorldCon, then my fundraiser has to be successful. I am very grateful to the people who have so far helped me raise just over $700, but in order to actually go, I’d need $1400. And honestly, I’m hoping to raise even more than that; any excess goes to the Center for Election Science (electology.org), which works to bring well-designed, more-democratic voting systems to contexts beyond just the Hugos. (The consequences of poorly-designed intraparty democracy are on full display these days in both the US and UK. And speaking as someone who lived in Guatemala for 10 years, many other countries would be happy to have as much intraparty democracy as those two.) All donations are tax-deductible in the US. Talk about voting systems and/or electoral pathologies in SF stories. For instance: in Too Like the Lightning, (minor spoilers to end of paragraph) one plot point is an asset voting system, that is, one in which voters can vote for any other valid voter, and each person who gets votes exercises power proportional to the number of votes they hold. This is an excellent voting system, and I’d be happy to discuss how it works / doesn’t work with the rest of the plot. Co-signers (all Rot13): Wnzrfba Dhvaa, Pynhqvn Ornpu, Obaavr Jnesbeq, Pngurevar Snore, Naqerj Uvpxrl, Ebtref Pnqraurnq, Qnivq Tbyqsneo, Yrr Rttre, Gnfun Gheare Yraaubss, Fgrira Unygre, Qnivq Jnyynpr. By Jameson Quinn: The discussion here of Hugo reform proposals (3SV, EPH+, etc.) will have a new thread anon. There’s a bit of a delay to make sure we’re not stepping on the toes of the people who were already working on this issue. As soon as we work this out, we’ll have a post that summarizes and explains a set of proposals from the previous threads, and a chance to discuss things further. This is a summary of the discussion thread on the post by Kevin Standlee discussing three proposals for expanding the Hugo nominations process in order to help avoid problems like the current list of Hugo finalists. In summarizing a thread that’s over 500 comments long, and that refers extensively to two other threads with hundreds of comments, I am of course going to simplify matters. In particular, I’m going to overemphasize the points of agreement, without listing every qualification, caveat, quibble, or outright objection that was brought up. Obviously you can read the thread yourself, but if you don’t, please imagine it to have all the disagreement and misunderstandings (as well as off-topic filk, execrable puns, cute references, hastily-constructed codes, etc.) that you’d expect. 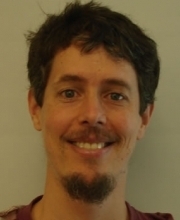 Of the three initial proposals by Kevin, one of them (nicknamed “+2” or “A+2”) relied on giving new discretionary powers to Hugo administrators. In the discussion thread this idea encountered significant opposition, so it will not be discussed further here. The other two proposals would both create a new intermediate round of voting, in which the initial votes have been used to create a “longlist” of 15 works which is publicized and voted on in some fashion in order to get the list of 5 finalists. In the Double Nomination with Approval Voting (“DN”) proposal, nominators would vote for (“approve”) the longlist items they liked the best; and in the 3-Stage Voting (“3SV”) proposal, a majority of nominators would be able to disqualify some of the 15 works, without affecting the ordering of the remaining works from the nominations phase. Many of the participants in the discussion began with a preference for DN; they felt better about voting for the longlist works they liked than about voting to reject the ones they felt were illegitimate. However, as the thread progressed, and the strengths and weaknesses of the two proposals were analyzed in more depth, the consensus shifted, and by the end of the thread proposals based primarily on 3SV were the clear winners. Many supported a proposal nicknamed 3SV+1, described below, which integrated some aspects of DN onto the base of 3SV. 4. Why 3SV and not DN? A. Under DN, voters would have just weeks to assimilate and vote on a list of 255 longlisted items. Many of the most careful nominators would barely vote for any; while the most prolific voters would probably be going mostly by kneejerk reactions. This is true for 3SV, too, but it is less of an issue as explained below. B. DN conflates two questions: “Do I like this work and feel it may deserve a Hugo?” with “Do I feel that this work’s presence on the longlist or in the list of finalists would be a legitimate result of honest fan preference?” In 3SV, those questions are separate, and votes to disqualify a work are based on the second question alone — one which does not require fully reading/reviewing every longlist work. C. Unlike DN, 3SV would deal decisively with the issue of “troll finalists”: that is, works promoted by slates explicitly in order that their shocking and/or offensive nature might cast discredit on the awards. D. 3SV would be similar in spirit to the “no award” option, except that works thus eliminated would not take up space on the list of finalists, and awkward moments at the awards themselves would be minimized. E. DN would open up new kinds of attacks on the list of finalists, such as actually increasing slate voter’s capacity to act as “kingmakers” and/or perform “area defense” against certain kinds of works. All they’d have to do was to have enough voting power to reverse the gap between two works which both have significant organic (non-slate) support. But under 3SV, actually eliminating a work would not be possible without a relatively high “quorum”* of voters, and we hope that community pressure would lead to a low background level of organic rejection votes, so a minority of slate voters would be unable to use rejection as a weapon. 3-Stage Voting (3SV) adds a new round of voting to the Hugo Award process, called “semi-finals,” between the existing nominating ballot and the existing final ballot. In 3SV, the “longlist” of top 15 nominees (as selected by the same process as the finalists will be selected; that is, EPH or EPH+ if those have passed) are listed in a way that doesn’t show how many nominations they received. Eligibility for this voting is being debated (see below), but the original proposal is that it would be restricted to members (supporting and attending) of the current Worldcon (not the previous and following Worldcons). Eligible voters presented with this list, with a question on each of the fifteen semi-finalists in each category: “Is this work worthy of being on the Final Hugo Award Ballot?” with the choices being YES, NO, and ABSTAIN. If a work gets more than a “quorum” of no votes, it is not eligible to become a finalist. There are several proposals for how to calculate the quorum. The formula may involve such things as the number of eligible voters, the number of “YES” and/or “ABSTAIN” votes, the turnout in round 1 or in previous years, etc. The idea is that the quorum should be high enough so that a minority of slate voters will be unable to reach it, but low enough that a clear majority of fans can pass it, even given reasonable turnout assumptions. During the “semi-final” voting period, admins would also be checking the eligibility of the works on the longlist, and accepting withdrawals from the author (or other responsible party; henceforth, we’ll just say “author”) of those works. The admins would make a good-faith attempt to contact authors, but note that since the longlist is public, the admins may assume that non-responsive authors have heard of their presence on the longlist, and thus that any authors who do not explicitly withdraw their works would accept becoming finalists. The finalists will be the top 5 works from the longlist that have not been declared ineligible by vote, found ineligible by the admins, or withdrawn by the authors. EPH or EPH+ would not be re-run after ineligible works or withdrawals. After the Hugos are awarded, admins would publish the usual statistics (that is, for EPH, the votes and points-when-eliminated for each of the members of the longlist). They would also publish the reason for ineligiblity (voted out, ineligible, or withdrawn) for any work that otherwise would have been a finalist. They would also publish the anonymized set of vote totals for each longlist item in each category, where “anonymized” means that they would not indicate which title was associated with which vote total. What’s this “3SV+1” you mentioned earlier? The “+1” means that, in addition to 3SV, all voters who were eligible for round 1 may add a single nomination per category, for something from the longlist they did not already nominate, to their existing ballot, during the same “semi-final” voting period. These combined ballots would then be counted by the usual process (that is, the current system, EPH, or EPH+) to find the finalists. How would all of this interact with EPH, EPH+, 4/6, and/or 5/6? The short version is that without EPH a realistically-sized, well managed slate could hope to entirely take over the longlist in many categories; with EPH, it could take about 2/3 (around 10 slots); and with EPH+, it could take over about half (6-8 slots), or possibly a bit more with cleverer strategies (but not as much as EPH, even then). 4/6 or 5/6 don’t change that story by much, though they help a bit in keeping organic slots among the finalists in spite of “kingmaker” slates. And +1 helps push slates towards around 1-2 finalist slots; hurting them in the common case that they had been going to get more, but actually helping them if they had miscalculated and were heading for less than that. Here’s a graph of how many slots slate nominators could have gotten in 2014, as a function of number of slate nominators, if they’d split 3 ways and had the same level of coordination as they did in 2015. Note that 2016 had many more nominators than 2014 so it would have taken more slate nominators to get the same effect. Couldn’t slate voters take over the shortlist? As you can see in the graphs “take over 6-10 slots of the longlist” is the only one that we think is a concern if (as we expect) EPH or EPH+ is in place. Wouldn’t this fundamentally change the nature of the Hugos? They have already been changed by the slate. Many of the people in the discussion felt that this change, though it would not go back to exactly as before, would still be a change in the right direction. Would this be more work for the administrators? In some ways, yes, of course. However, in at least one important way, it would actually simplify their lives. Since the longlist would be public, it would be much easier for them to contact authors. On a related note, authors could not leak their status as finalists, because until the list of finalists came out, they would know no more than the public at large. Would this allow some unanticipated downside? Obviously, we can never rule that out 100%. However, we do think we’ve been pretty thorough at exploring all the angles. Again, you can read the thread and decide for yourself. Would this be tough to administrate? Not if EPH or EPH+ were in place, since any program capable of doing either of these would already be able to associate multiple nominations with the same nominator and make sure that invalid votes, such as a single nominator nominating a given work multiple times, were not counted. It has been suggested that a proposal to institute +1 should say that this change will sunset (require re-approval) if EPH or EPH+ ever does. What are the open questions/issues? Eligibility: who should be eligible to vote on the semifinal round, and who should be able to add +1? The former question is more fraught. Several people said that they would want eligibility to be restricted enough that outsiders can’t come in and get memberships after the longlist is published. Others said that it is important to let the community respond and that if membership spikes on seeing the longlist that could be a healthy thing. One compromise proposal (suggested by yours truly) was that in order to be eligible, you would need to be a current member (attending or supporting) of this year’s Worldcon, AND also have been eligible to nominate (whether or not you actually did so). So if you were a member of the prior or following year’s worldcon, you could sign up after seeing the longlist; but not if you weren’t. Quorum size/formula: There’s been various discussion of this issue. +1 as attached or separate: The overall consensus seems to be that, if we propose +1, it should be in a separate proposal from 3SV, even though they share certain aspects (such as the concept of a semi-final round). However, there are varying opinions on whether +1 is a good idea, either in general or as a proposal for this year in particular. Whether to try EPH+ this year: I’ll talk about this more in comments. The admin discretion 14-18 longlist thing: I was thinking that, if the time between closing round 1 nominations and announcing the longlist is short, admins might have a hard time cleaning the data perfectly. In that case, it helps them be more certain of the list they publish if the next work below the list was not a near-tie with the lowest work on the list. To allow them to avoid such near-ties, especially in cases where they aren’t 100% sure they’ve cleaned the data perfectly, I suggested allowing them discretion to decide how long the longlist for each category would be, between 14 and 18 works. http://file770.com/?p=29020&cpage=14#comment-436327: Define “nominating membership” in a way that legally allows for the possibility of a code of conduct that could lead to one year’s worldcon revoking voting privileges from a member of the prior year’s; in other words, closes the loophole whereby prior-year members are immune from any consequences for their actions. Moderated Shortlist for Member Consideration: http://file770.com/?p=29020&cpage=16#comment-436437 This is an alternative to 3SV, where an administrative committee would tentatively suggest eliminating or adding certain works, and that suggestion would have to be ratified by an up-or-down vote of the members of the current Worldcon. A group led by Colin Harris that includes Kevin Standlee is writing up a proposal are writing up a proposal and are surely watching these threads. When that proposal is ready, we could write up +1 as an amendment or as a standalone proposal. Decide about EPH+ and deal with that. Anything else? 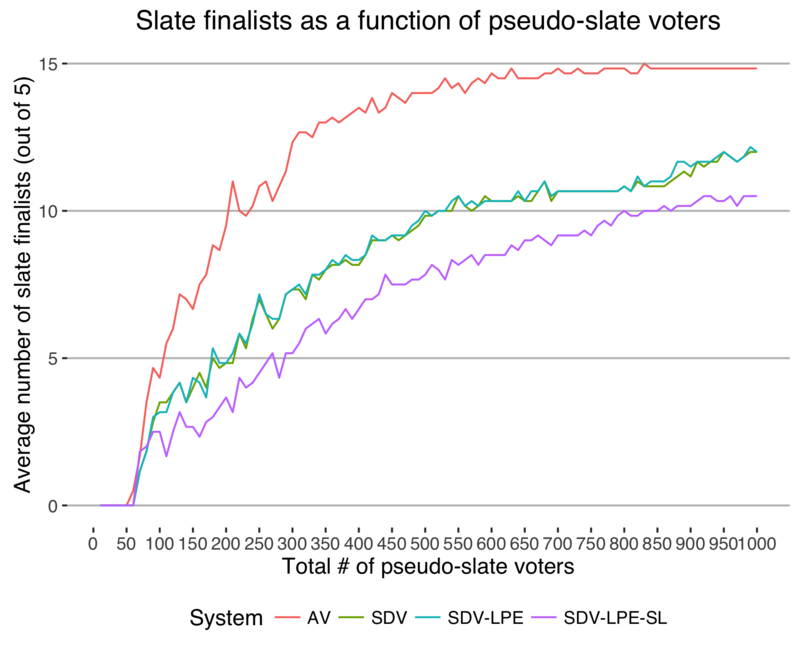 By Bruce Schneier: Jameson Quinn and I analyzed the E Pluribus Hugo (EPH) voting system, proposed as a replacement for the current Approval Voting system for the Hugo nominations ballot. (This is an academic paper; the Hugo administrators will be publishing their own analysis, more targeted to the WSFS Business Meeting, in the coming weeks.) We analyzed EPH with both actual and simulated voting data, and this is what we found. The number of slate nominees would have been reduced by 1 in 6 categories, and by 2 in 2 categories, leaving no category without at least one non-slate nominee. That doesn’t seem like very much. A reasonable question to ask is why doesn’t it reduce the number more. The answer is simply that the slate was powerful last year. The data demonstrates the power of the Puppies. The category Best Novelette provides a good example. This category had 1044 voters, distributed over 149 different works with 3 or more votes. Of these voters, around 300 (29%) voted for more Puppy-slate works than non-Puppy ones, and about half of those (14%) voted for only Puppy-slate works. These numbers are also roughly typical. The other 71% of the ballots included under 3% with votes for any Puppy work (this is relatively low, but not anomalously so, compared to other categories). Despite being a majority, the non-Puppy voters spread their votes more thinly; only 24% of them voted for any of the top 5 non-Puppy works. This meant that 4 of the 5 nominees would have been from the Puppy slate under SDV-LPE or SDV. In Figure 1, we assume perfectly correlated bloc voters. They vote in lockstep (with minimal exceptions to prevent ties), and their five nominations are completely disjoint from the other nominations. As you can see, both SDV-LPE and SDV reduce the power of the bloc voters considerably. Under AV, the voting bloc reliably nominates 3 candidates when they make up 10.5% of the voters, 4 candidates when they make up 12.5%, and 5 when they make up 19%. Under SDV-LPE, they need to be 26% of voters to reliably nominate 3 candidates, 36.5% to reliably nominate 4, and 54% to reliably nominate 5…. Figure 2 simulates a more realistic voting bloc. We sample the actual behavior of the bloc voters in the 2015 Hugo nominations election, and add them to the actual 2014 nominations data. For the purposes of this simulation, we define bloc voters as people who voted for more Puppy candidates than non-Puppy candidates. In this case, the actual bloc voters did not vote in lockstep: some voted for a few members of the slate, and some combined slate nominations with non-slate nominations. For the purposes of the simulation, when they voted for the nth most popular non-Puppy candidate in 2015, we imputed that into a vote for the nth most popular non-Puppy candidate in 2014. In this case, SDV-LPE and SDV reduce the power of those voting blocs even further. Under AV, the voting bloc reliably nominates 3 candidates with 14% of the voters, 4 candidates with 17% of the voters, and 5 with 39%. Under SDV-LPE, they need to make up 27.5% to nominate 3 candidates, 38% to nominate 4, and 69.5% to nominate 5…. The upshot of all this is that EPH cannot save the Hugos from slate voting. It reduces the power of slates by about one candidate. To reduce the power of slates further, it needs to be augmented with increased voting by non-slate voters. There is one further change in the voting system that we could make, and we discuss it in the paper. This is a modification of EPH, but would — for the slate percentages we’ve been seeing — reduce their power by about one additional candidate. 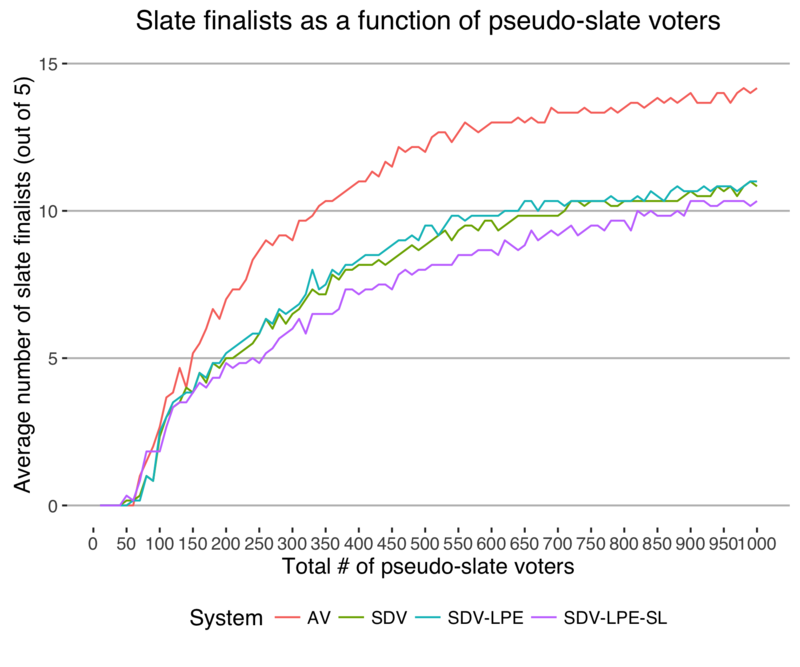 So if a slate would get 5 candidates under the current system and 4 under SDV-LPE (aka EPH), it would get 3 under what we’ve called SDV-LPE-SL. Yes, we know it’s another change that would require another vote and another year to ratify. Yes, we know we should have proposed this last year. But we had to work with the actual data before optimizing that particular parameter. Basically, we use a system of weighing divisible votes named after the French mathematician André Sainte-Laguë, who introduced it in France in 1910. In EPH, your single vote is divided among the surviving nominees. So if you have two nominees who have not yet been eliminated, each gets half of your vote. If three of your nominees have not yet been eliminated, each gets 1/3 of your vote. And so on. The Sainte-Laguë system has larger divisors. If you have two nominees who have not yet been eliminated, each gets 1/3 of your vote. If three of your nominees have not yet been eliminated, each gets 1/5 of your vote. Each of four get 1/7; each of five get 1/9. This may sound arbitrary, but there’s well over a hundred years of voting theory supporting these weights and the results are still proportional. SDV-LPE-SL comes even closer to giving slate voters a proportional share, with 7 fewer slate nominees overall, and only 1 category without a choice between at least 2 non-slate nominees. Under SDV-LPE, they need to be 26% of voters to reliably nominate 3 candidates, 36.5% to reliably nominate 4, and 54% to reliably nominate 5. Under SDV-LPE-SL, they need to be 35% for 3, 49% for 4, and 66% for 5. Under SDV-LPE-SL, they need 36% for 3, 49% for 4, and over 70% for 5. Here’s our paper. It’s academic, so it refers to the voting system by its academic name. It spends a lot of time discussing the motivation behind the new voting system, and puts it in context with other voting systems. Then it describes and analyzes both SDV-LPE and SDV-LPE-SL.